The bullish gap up above consolidation is a great pattern to help you spot stocks that are going to go higher. For a stock to gap up higher, it means that there is extreme bullishness in the stock. 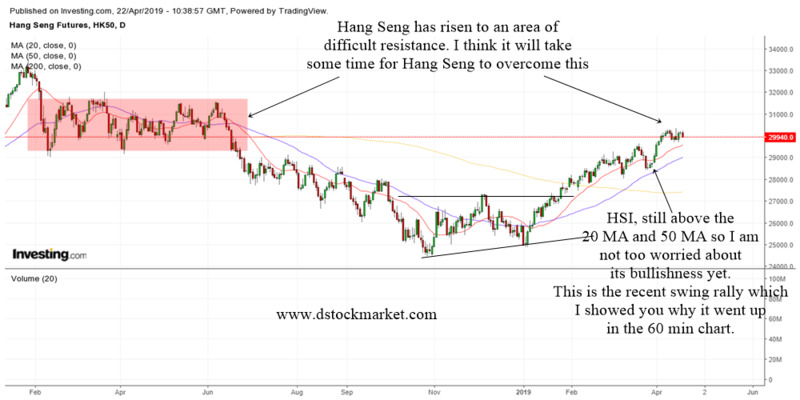 The demand outweighs supply and therefore the stock that experiences a gap up is a picture of strength. 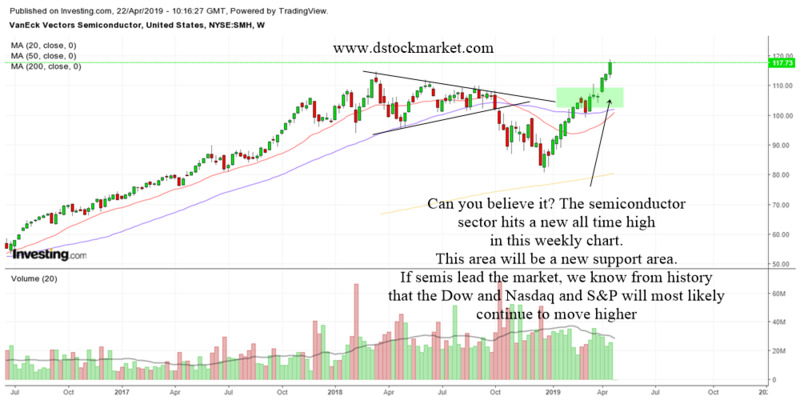 The chart above shows how a bullish gap up above consolidation looks like. 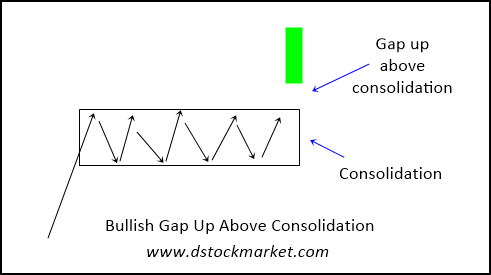 The consolidation is a period where the stock trades sideways for a period of time. It could be 10 bars or even 20 bars. The most important thing is there is a period of relatively tight sideways trading in the stock. The consolidation is a period of rest and can actually show strength in the stock. Some stocks often go up and then have a correction. 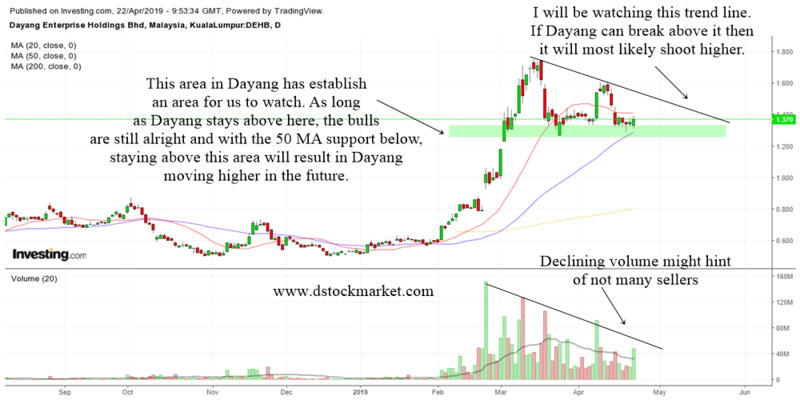 The fact that the stock traded sideways shows that there is strength in the stock and that it is likely to move higher. Some traders will wait for a breakout. That is a very good trading strategy. But in this article, we are looking for a stock that gaps us above the consolidation instead of breaking out. First of all there needs to be a consolidation in the stock. The stock should trade sideways for awhile. It should be relatively tight and not too wide or whippy. The consolidation should also have at least 8 bars. It can be longer and sometimes can last for a long time. Finally the stock should gap up above the consolidation. To be able to spot the gap up, the trader should start to keep the stock in their watchlist once they notice the stock consolidating. Then you need to put an alarm at the top of the consolidation. When the stock trades above the highs of the consolidation the trader can be alerted to the breakout. The chart above is the daily chart of Apple. The stock traded sideways in late March to the end of April. The trader can draw a box on the consolidation so that he or she can see the pattern clearer. Apple then gap up above the consolidation and then proceeded to go up higher 2 weeks. 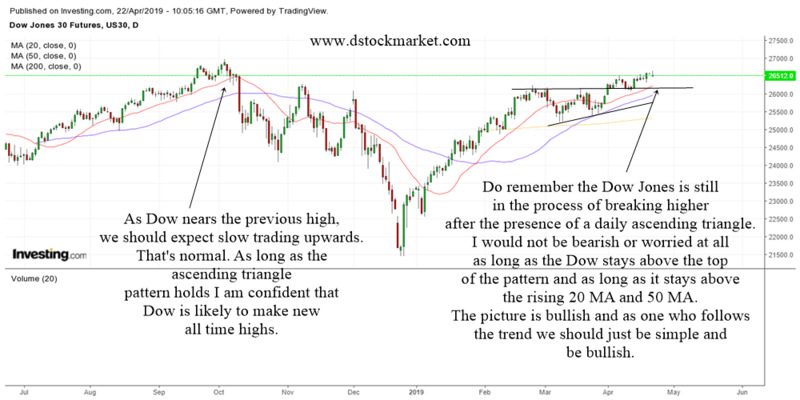 When a stock makes a bullish gap above a consolidation, the stock can go up for a few days to a few weeks and sometimes even start a super bull run. While we do not know how high the stock can go, traders can expect at least a nice swing trade for a few days to a week or two. As mentioned earlier, the bullish gap up above consolidation can be swing trading candidates. Once the trader has spotted a consolidation he or she can put an alarm above the consolidation to alert him or her of a potential swing trade opportunity. At other times the trader can look at the gap up list on the scanners and try to spot a stock that is gapping up above a consolidation. Once a setup is found, the trader can buy the stock for a swing trade. Ideally, the stock should have had a nice run up before the consolidation pattern formed. Because a trend in motion often stays in motion, the gap up above the consolidation can often be a continuation to the trend. Therefore, the trader who trades this pattern is playing with the trend rather than against it. CDNA above had a nice run up prior to the consolidation. 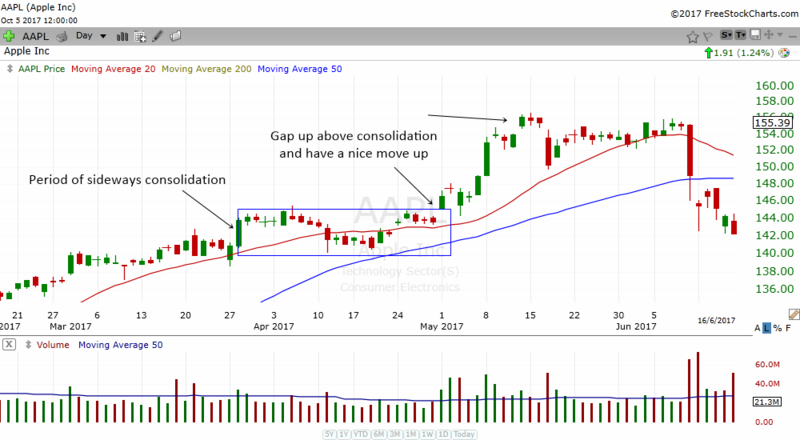 After trading sideways for awhile, the stock gap up above the consolidation. The trader can buy the stock the moment it gaps up above the consolidation and put a stop below the box. Notice how CDNA run up nicely after the gap up? I'm sure you have heard about the saying "The Trend Is Your Friend". What this means is you should find trades that are going with the trend. This will increase your odds of success. 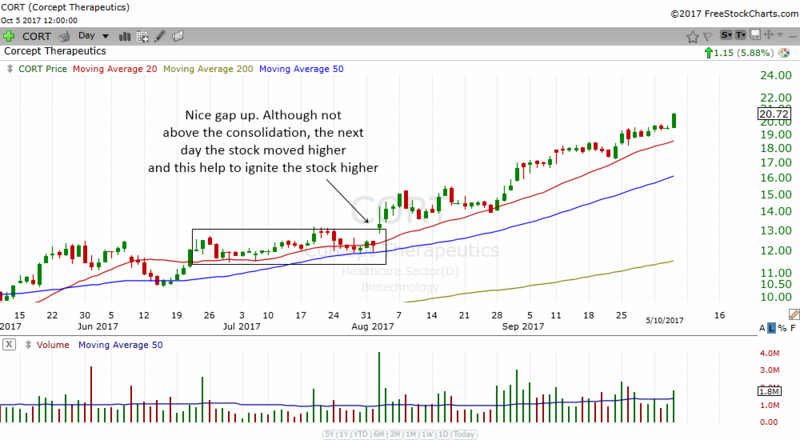 When a bullish gap up above a consolidation appears in a stock that is in an uptrend, it can often work very well. 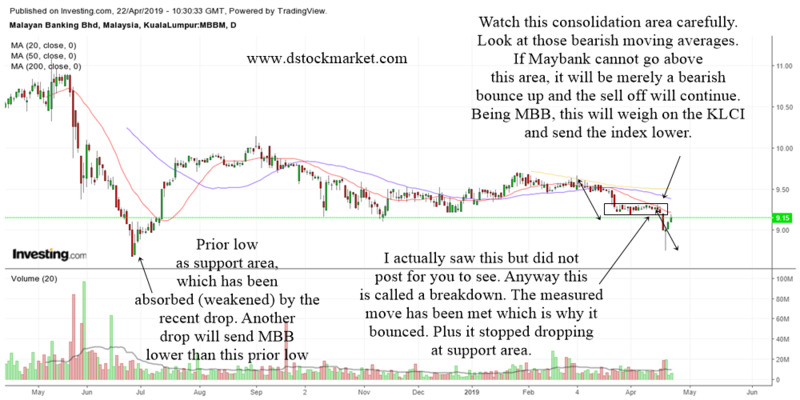 If the stock is above all three MAs then we can consider the stock to be in a nice uptrend. 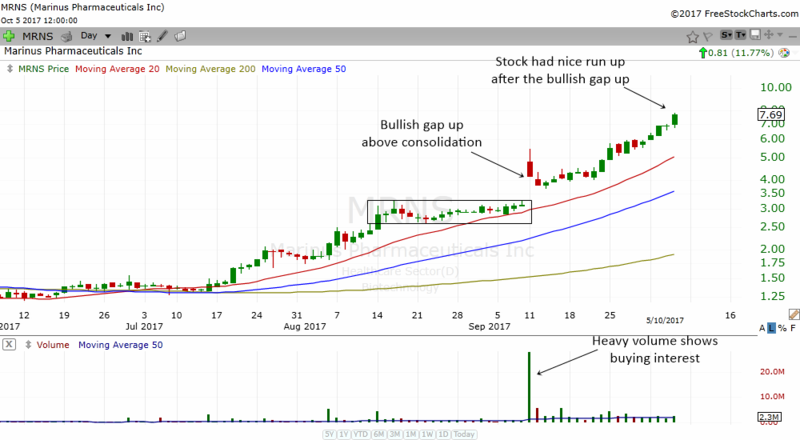 MRNS was already in a nice uptrend when the pattern formed. Notice how the stock was trading above its rising 20 MA, 50 MA and the 200 MA. Then on September 11, the stock had a nice gap up. Although the stock declined a bit the next day it never went back to the consolidation. Instead the stock continued to ride the trend and moved higher. 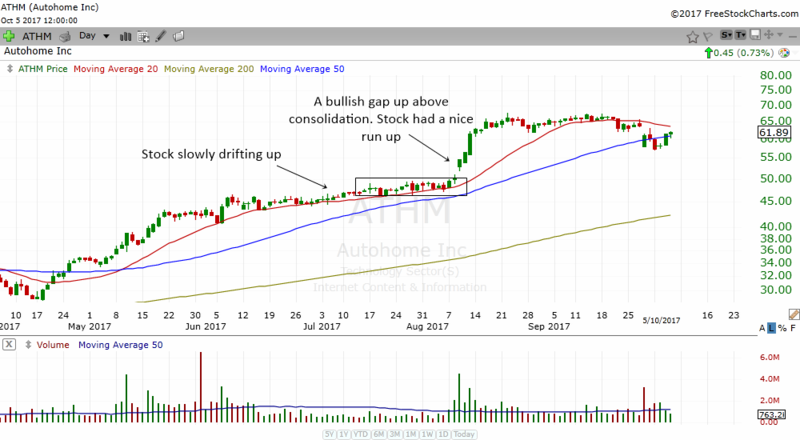 ATHM is another good example of riding the trend higher. The stock was already in a very good uptrend when the gap above a consolidation happened. The stock was trading above its rising 20 MA, 50 MA and 200 MA. Once the stock gap above the consolidation, it produced a nice run up for a few days. This can be a great swing trade for observant traders. If the gap up above consolidation comes with heavy volume, it can often point to big gains in the future. 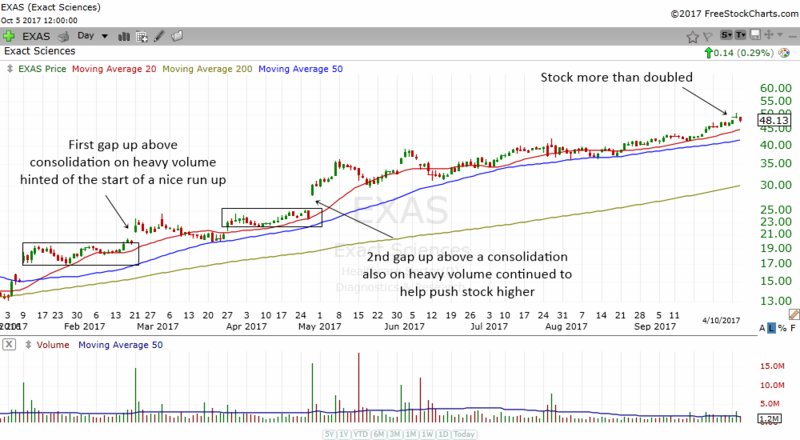 A nice gap up with heavy volume shows strong buying interest in the stock and the stock can go on to make great gains. This is especially true when the gap up above consolidation happens right after the stock has bottomed or in the middle of the trend. 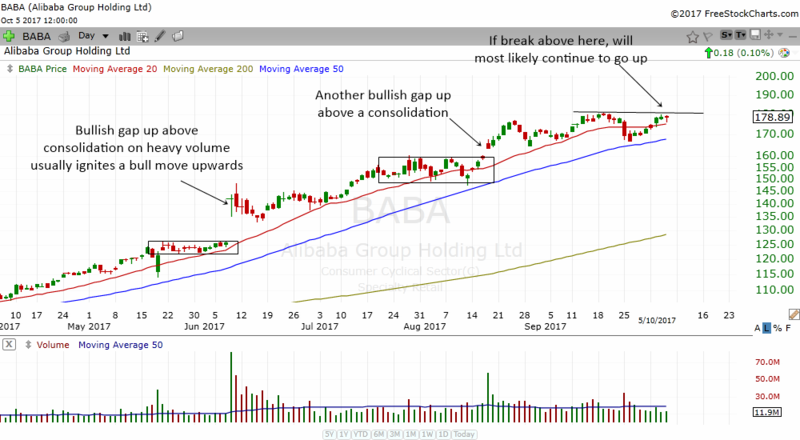 The chart of BABA above shows two very good examples of gap up above consolidation with heavy volume. The first one happened in June 2017. After the gap up on heavy volume, the stock continued to drift higher. The second gap up above a consolidation happened in August 2017. Although the gap up occurred on less volume then the first gap up, the volume was still way above the daily average volume. Notice how the stock continued to drift higher after that. 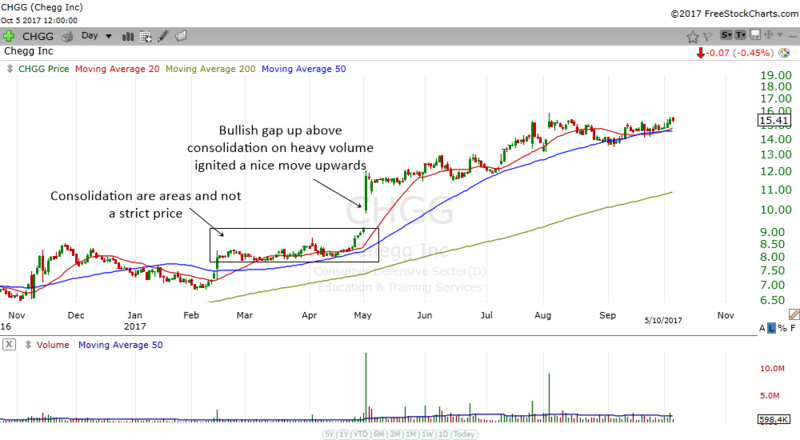 When you see a stock that is in an uptrend consolidating and then gapping up on heavy volume, you can have confidence to hold on to the stock a bit longer. There is very good buying interest in the stock and you can often ride the trend higher. Here are more examples of stocks that have successfully made the bullish gap up above consolidation pattern. Continue to study these examples and memorize this pattern very well. There will be slight variations but they all have gap up above consolidations. 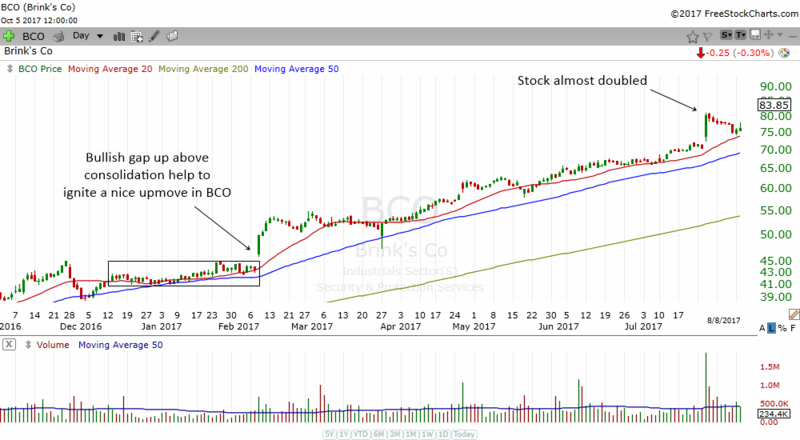 BCO had a nice consolidation from December 2016 to February 2017. Some may see that the stock as making an ascending triangle. The stock gap up above the consolidation in February and from there onward, the stock continued to grind higher. The stock stayed above the rising 20 MA and rising 50 MA most of the time. This is a sign of bullishness and therefore the trader can have confidence to hold on to this stock. CHGG had a nice gap up after making a consolidation. The consolidation is a bit wide but the pattern still works very well. Notice how the stock experienced heavy volume on the day it gap up. This shows that there is accumulation in the stock. The stock continued to rise steadily after that. CORT is another good example. It consolidated and then gap up on heavy volume. Notice how the stock continued to drift higher after that. 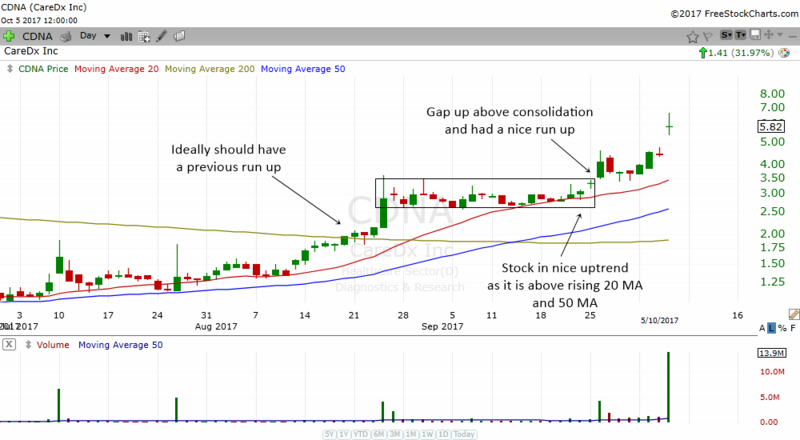 From August 2017 onward, the stock has risen a lot and gained more than 50%. EXAS is the last example I'm showing you. There are a few things that made this stock such a superb winner. Memorize this chart and you might just find the next big winner. The stock more than doubled after the first bullish gap up above consolidation. You have now learned a very useful bullish chart pattern. This pattern will happen again and again in stocks. It is a picture of bullishness that you should memorize. You have also learned the many ingredients that make a stock great. They are gap ups, unusual volume and a simple trend analysis. Learn this pattern well and read this page a few times and you will be able to spot a great stock the next time you see this pattern in a chart.